In five shows, between April 7th and 8th, at the Ryerson Theatre, the Ryerson School Of Fashion showcased their annual fashion show, Mass Exodus 2011. 4th year Fashion Communication and 3rd year Fashion Design Students worked together over the course of 7 months to bring to thousands of spectators, a truly astonishing show. The abilities of 20 of Ryerson’s most talented Design students were showcased, who each created their own collection with 5 pieces. The concept of Mass Exodus 2011 was Zenith + Nadir. Throughout the show, spectators followed the storyline of Nadir (the dark, unknown side) and Zenith (the enlightened wonder). The idea was to leave the viewer with their own sense of personal reflection into what is all around and in between our reality. Amongst the crowd was also a group of 11 women who graduated from the School of Fashion in 1960. They got to witness how far the passion for fashion has come since they were students. Mass Exodus 2011, Zenith + Nadir collectively showcased the amazing potential of Canadian designers in the world of fashion. The Ryerson Fashion show was outstanding! 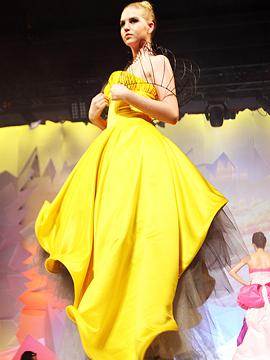 With Ryerson alumni appearances, incredible designs and enjoyable music, the entire show was a complete success. Ryerson also created its very first magazine for this year’s fashion show. The magazine was very impressive, and included designs and write-ups on each designer that was featured. When the show began, the audiences’ attention was immediately captured by the beautifully decorated set. The set’s design was minimal: with white triangles everywhere, it was simple but dimensional, adding to the appeal of the show. Ryerson did a tremendous job with the effects on stage and short film that played at the beginning and throughout the show. The designs were diverse and completely original. To top off a great night full of fashion and fun, we got to meet designer Sunny Fong from Project Runway Canada. 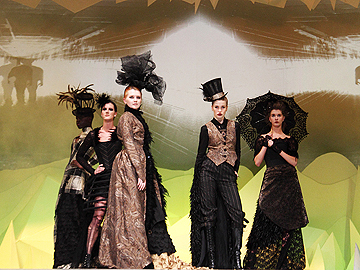 Check out more on Ryerson, the show and their fashion programs here! Written with files from Lauren Song. Photos by Carrie Cai.